tata – mystery no more! i didn’t mind what the pattern says about colours and just decided to do mine with stripes. it’ll be interesting to see it that goes with the completed project. yarn mystery – stash buster!? but what colour combination to choose..? i need about 500 g for the mysterious project…. 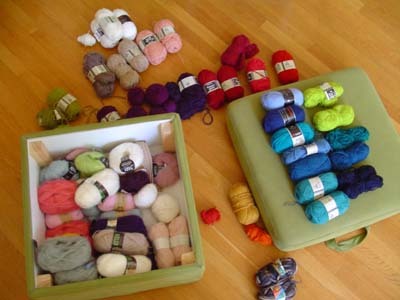 everytning outside the box is feltable yarn, which is what’s needed. right now i’m drawn ot the white/beige/pink, but i’ll go out for a while, come back and look at it with fresh eyes…. 🙂 the sun is shining on this happy saturday! i joined the yarn mystery at hobbyboden.com! first part of it starts on thursday at 7 p.m.